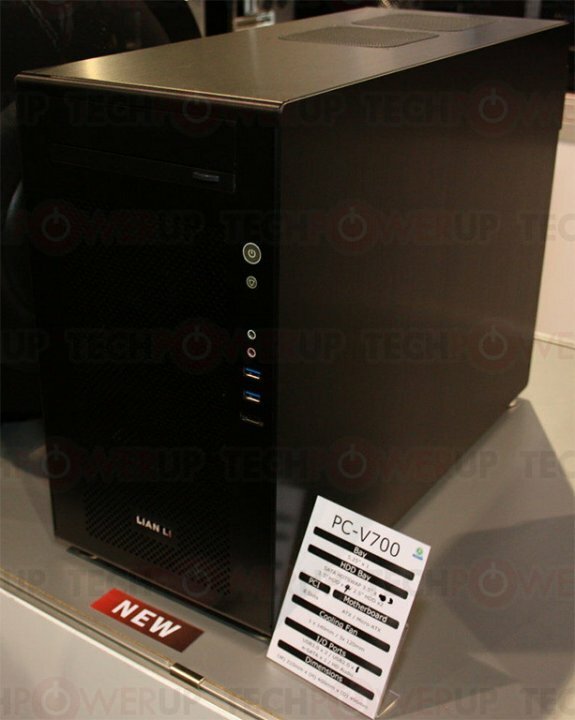 TPU spotted Lian Li's PC-V700 at CES 2012. This new aluminium mid-tower fits ATX and Micro-ATX motherboards, it measures 210mm x 400mm x 496mm (W x H x D) and supports four fans. Its only exposed drive bay on its front is a valved 5.25-inch. Other drive bays include three hot-swap capable 3.5-inch bays (side), four conventional 3.5-inch bays, and two 2.5-inch bays. Cooling fans include one 140 mm front intake, two 120 mm top exhausts, and one 120 mm rear exhaust. It features 8 expansion slot bays letting you use a double slot graphics card installed in the lowermost expansion slot. Front panel connectivity includes audio, two USB 3.0 ports, a USB 2.0 port, and an eSATA port (extended from the motherbaord).